AP Physics B aspirants are expected to have a clear understanding of the standing wave modes for stretched strings fixed at both ends. They should also have a clear understanding of standing sound waves in pipes with either closed or open ends. A pipe closed at both ends is of no use and therefore of no interest to us. You should note that a closed pipe means a pipe closed at one end. An open pipe means a pipe open at both ends. The following multiple choice practice questions are meant for checking your understanding basic points in respect of waves and the physics of standing waves (stationary waves) in stretched strings and air columns (in pipes). Sound requires a material medium for its propagation. So sound does not pass through vacuum. Intensity of any wave is directly proportional to the square of the amplitude. Therefore, when the amplitude becomes 1.5 times (increment by 50%) the original value, the intensity becomes 2.25 times (1.52 times) the original intensity. The increment in intensity is 125% [Option (c)]. (3) Ultrasonic waves from a sonar undergoes refraction at the interface between water and air. Which one of the following characteristics of the wave remains unchanged? The correct option is (c). The period (and of course frequency) of the wave remains unchanged. (4) A stationary sound wave is produced in a resonance column apparatus using an electrically excited tuning fork. If P and Q are consecutive nodes, which one of the following statements is correct? In a stationary wave the particles of the medium at the nodes will be always at rest. The phase of vibration of particles (of the medium) lying on one side of a node is opposite to the phase of vibration of particles lying on the opposite side. Therefore, if one node is a position of condensation, the next node is a position of rarefaction [Option (a)]. 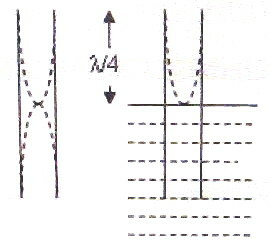 λ/4 where λ is the wave length of sound. Evidently λ/4 = half the length of the pipe so that the wave length in the fundamental mode is the same in both cases. Therefore, the fundamental frequency is unchanged on dipping half the length of the pipe in water [Option (d)]. The distance between consecutive nodes (or anti-nodes) in a stationary wave is λ/2 where λ is the wave length. Therefore we have (from the figure) λ/2 = 0.5 m so that λ = 1m. (7) What is the fundamental frequency of vibration of the string in the above question? λ1/2 = length of string = 1.5 m so that λ1 = 3 m.
Substituting, n1 = v/λ1 = 30/3 = 10 Hz. [You can work out this problem in no time remembering that the fundamental frequency is one third of the frequency with which the string vibrates with three segments. If the string were originally vibrating with four segments, the fundamental frequency would be one fourth].